Rust combines low-level control over performance with high-level convenience and safety guarantees. Rust 1.0 just got released. Let's see how and why can we use it with Node! Before jumping into Rust and its ecosystem, let's step one back and take a look on what Rust promises. Why Using Rust with Node.js? There can be a number of reasons where Rust can be complementary to a Node.js application. Also, you may ask yourself: why should I use Rust when we already have addons with great helper modules like nan? The short answer for that is if you need to have access to V8/libuv, then you should always use the native addons if not, then you should go for the best tool for the job. Blocking the event loop - something that I am sure you don't want to do. If you have lots of synchronous operations, it can easily happen that you will block it. These operations can run in a separate process, using Rust for example. Later on we will take a look on how you can do something like this. 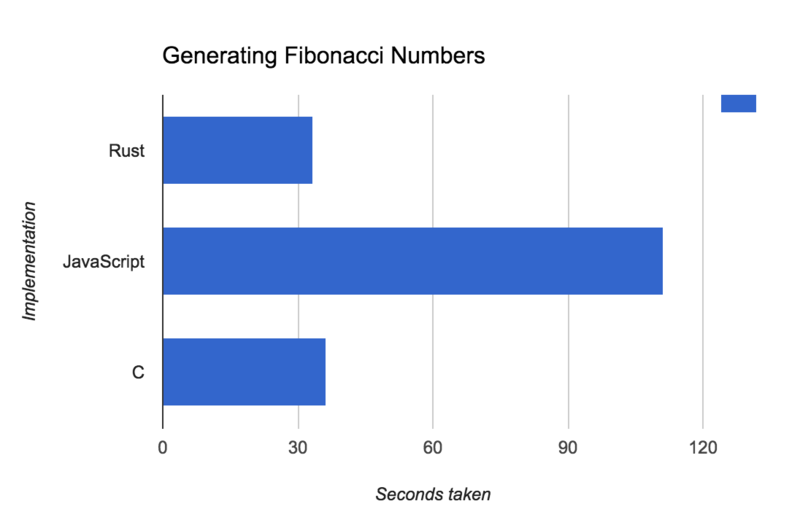 For the eager ones: you can see a chart below showing how many seconds did it take with Rust, Node.js and C to generate the 40th Fibonacci number a 100 times. As an example project, let's create the one showcased before: a small application that can generate Fibonacci numbers. If you are using a Mac, you can simply install it using Brew, or visit http://www.rust-lang.org/ to download the installer for you operating system. Rust comes with Cargo - Cargo is kind of like NPM in the Node world, except it not just manages your dependencies but also capable of building your projects as well. The very first thing that we need when using Cargo is Cargo.toml (like package.json in the Node world). You can build and run this very basic application using cargo run, or if you just want to build it then cargo build. Now we can build any Rust project - it is time to integrate it with Node.js. For this purpose, we are going to use something called Foreign Function Interface, FFI in short. The #[no_mangle] instructs the Rust compiler not to modify the name of the function, the pub makes it publicly available outside of this module as well, and the extern tells the compiler to make it callable through the C interface. Not a lot of changes, right? These extra lines tell the compiler that we want to create a dynamic library from the source as well, what can be ran from any language, including Node.js as well. That's it, you are calling Rust from Node.js now! What are your thoughts on Rust? Share your experience in the comments below.